Barclay's Capital has suggested that a quarter of all worldwide book sales in 2015 will be made up of eBooks. This has to be a wake-up call to publishers who are still trapped in the print-on-paper world. It also has serious ramifications for bricks-and-mortar bookstores, libraries and the entire supply chain which supports them, as the rationale for their very existence comes under threat. Publishers themselves are threatened by the lower selling prices that eBooks command compared to print-on-paper books; even though there are savings on printing, binding, warehousing and shipping costs. Publishers are also under threat as authors bypass them altogether and self-publish. Unfortunately, the nascent eBook industry does not operate as one large happy family, but rather in a Tower of Babel with different eBook reading languages on competing devices offered by ruthless dog-eat-dog competitors; each of which is fighting for market share. It is no wonder that many publishers, self-publishers and authors are confused. That’s where this book can help them. It reviews the myriad of different devices on which eBooks can be read and then it covers the different computer languages used to deliver them. Readers will find out what’s involved in preparing their material so that it can be read in eBook format. The Internet attracts readers on a world-wide basis but publishers face a challenge in a world where, according to UNESCO, over a million new book titles are published every year. The challenge of "discoverability" is of paramount importance. That’s where metadata and keywords are starting to replace traditional advertising as a means of making a book’s availability known around the world. This book discusses some of the ingredients that go into creating a metadata file such as the ISBN as well as the BIC and BISAC classification schemes. It also covers other topics that are not involved in creating matadata, such as legal deposits and Cataloguing in Publication (CIP). The pricing of eBooks is a concern to most publishers and this book contains a candid discussion of accepted pricing structures and warns them about the risk of cannibalizing the sales of the print-on-paper versions of their titles. It also covers Value Added Taxes (VAT, HST, GST) as well as some of the tax implications when entering into agreements with US book resellers. Digital Rights Management (DRM) is important when trying to reduce the risk of piracy. New distribution and selling models are emerging for eBooks and readers are given a review of the books aggregators, wholesalers and agents. It discusses educational models, subscription and lending as well as a "one-stop-shop" for eBook distribution. In short, this book will lead readers through the complex world of eBooks, how to create them and make money selling them. Chapter 2: Welcome to the Electronic Tower of Babel! Chapter 11: Metadata & the Challenge of "Discoverability"
Chapter 15: The Taxman is Ready to Bite You! 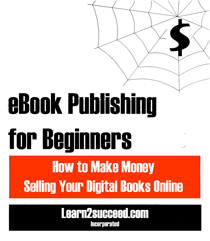 eBook Publishing for Beginners: How to Make Money Selling Your Digital Books Online by: Learn2succeed.com Incorporated: Softcover; 112 pages; ISBN: 978-1-55270-456-1 published in 2012; $19.99.